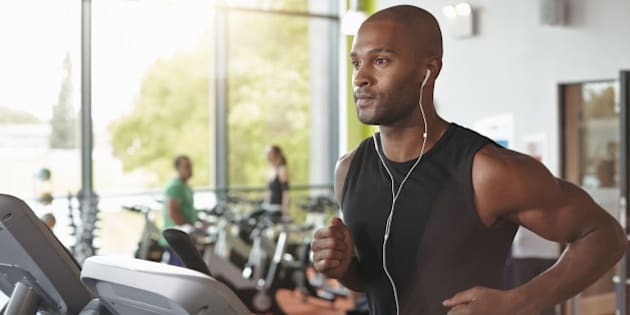 Man in a gym running on a treadmill with head phones in. Whether you're a varsity athlete, a fanatic CIS football fan or a casual gym-goer, it's important to know how your future university stacks up in fitness and athletics. UniversityHub has asked more than 1,000 students to rate their university's sports and recreation facilities, in addition to more than 50 other factors. See the top 10 schools below, or explore the full rankings at UniversityHub.ca. For such a small school, Bishop's has a world-class athletic culture and facilities. They attract student-athletes from all over the country, particularly for their football team. They just opened a brand new sports and recreation centre in 2015, and it's beautiful. You'll see plenty of purple T-shirt-wearing BU students keeping off the frosh 15. Queen's opened the 'ARC' in 2010, and it's a stunning facility with world-class equipment -- helping take their sports teams to the next level. Their football team has typically been a strong contender, and the community is fairly supportive of athletics and varsity athletes. Go Gaels, Go! Sports are a huge part of SFX's culture. There are approximately 275 "X-Men" and "X-Women" playing on varsity sports teams at the school. Their Keating Millennium Centre is, simply put, massive. The building can hold over 2,200 people, and is home to two ice surfaces, a gym and more. At Acadia University the student-athlete population is nearly 10 per cent of the campus. They are known for the ability to combine academics, athletics and community engagement. There are 11 varsity teams and a multi-purpose athletic complex. The fitness centre within the complex just received a facelift with brand new equipment thanks to a generous donation from the students' union and alumni. Ever been to a football came at Laurier? If so, you'll understand why they came in at number five. For its size, Laurier is one of the most athletic schools, with over 500 athletes on 18 varsity teams. In addition to varsity athletics, there are loads more sporting opportunities, including an Olympic sized swimming pool, dance studio and triple gym. Get ready to rep that purple and gold! The Carabins is the name of the sports teams at the University of Montreal. They play at the CEPSUM Stadium, a massive complex built for the Montreal Olympics in 1976. Their football team resumed play in 2002 after a 30-year hiatus and won the Vanier Cup in 2014. What a comeback! The university teams go under the name of the Guelph Gryphons and the athletics program is sponsored by Russell Athletics. There are four main branches of athletic areas at the university, each housing a variety of facilities for various purposes and sports. This includes pools, AstroTurf pitches, ice rinks and gymnasiums. The ice hockey, field hockey and cross-country teams have achieved big successes recently. The University of Saskatchewan's athletics teams go by the name of Huskie Athletics and provide the opportunity for students to play sport at an elite level while obtaining a university degree. Huskie Athletics provides Saskatoon with a little bit of everything for all types of sports fans. With 73 national titles to its name, the Vikes (University of Victoria) athletics program is proud to be one of the best in Canada. UVic has top athletes competing in eight varsity sports. The Vikes 16 varsity teams compete in Canadian Interuniversity Sport, Canada West, National Association of Intercollegiate Athletics and other provincially based leagues. Many Olympians, Paralympians and other national team athletes have trained and studied at UVic. The University of New Brunswick offers a mix of varsity and club sports as well as many recreational activities. UNB is immensely proud of its athletes and promises to "keep their deep roots" in the communities which support them and strive for both academic and athletic excellence as they prepare University of New Brunswick graduates to be leaders either on- or off-the-field.